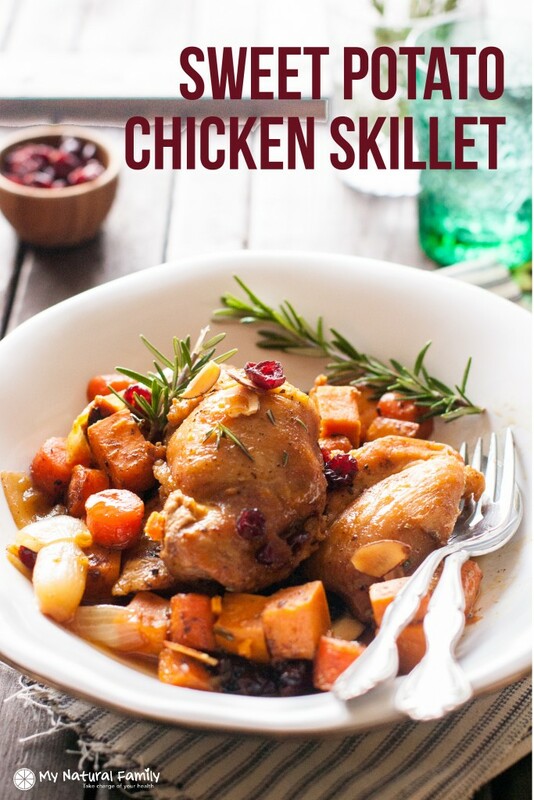 This Maple Roasted Chicken with Sweet Potatoes skillet recipe is all made in one pan and is super easy. It’s perfect for fall with sweet potatoes and cranberries. The only work is getting started and putting the ingredients in the pan and browning the chicken. After that, all you do is move the pan to the oven do anything you want while the chicken and sweet potatoes get a delicious, caramelized coating on them. Your kitchen will smell fantastic! Fall is officially here in Utah! The trees are starting to get bare. The leaves are falling. The air is cooler. We are now moving into a different type of weather and season. 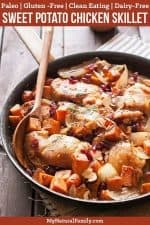 We thought this Maple Roasted Chicken with Sweet Potatoes skillet recipe would be perfect for fall. Really it would be great any time of the year, especially on the Paleo diet. Cause I kinda think the sweet potatoes/yams – whatever you want to call them – are the perfect Paleo carb. I love how I can throw all the ingredients in one pot and I really like how you get a light caramelization from the sweet potatoes. I love the surprise flavor from the rosemary and the dried cranberries and I love how the entire meal is in one dish. If you don’t already grow rosemary, I’ve found it to be one of the easiest herbs of all to grow. I’ve had really good luck growing it outdoors in my garden, and sometimes it will even winter over. I’ve also had good luck growing one indoors under a grow light. I just love to be able to cut fresh rosemary whenever I want. It’s one of my favorite herbs and so expensive to buy in the store. If you grow it outside, the plants get huge and you can get tons of it and dry it and dry enough to last for years and/or to give to all your friends and neighbors. To toast the almonds, put them in a single layer on a baking sheet and bake at 350 until golden brown. I’ve never timed how long that takes, but maybe 10 minutes or so. This dish is colorful and flavorful, as well as pretty easy to throw together. I added rosemary because it paired well with the flavors and added a nice pop of color. Make sure to use a pan that is oven-proof, as well as a lid. I haven’t tried it, but I totally bet you could use a turkey tenderloin and make this for a simple Thanksgiving dinner for one or two. This dish is really good served with Brussel Sprouts on the side too. I think these Maple Roasted Chicken with Sweet Potatoes turned out great. What do you think? Will you be giving it a try? Do you think your family would eat this and enjoy it? Share your comments and results with me below! 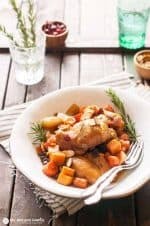 This dish was colorful and flavorful, as well as pretty easy to throw together.I added rosemary because it pared will with the flavors and added a nice pop of color. Make sure to use a pan that is oven-proof, as well as a lid. Heat the oil in a large frying pan to medium high. Season both sides of the chicken thighs with the coarse salt and pepper. Add the chicken to the hot pan and brown well on both sides. Remove the chicken from the pan and set aside. Add the sweet potato, carrots, and onion to the same pan the chicken was cooked in and saute until the vegetables develop some caramelization, about 5-6 minutes on medium/high heat. Add the garlic, rosemary, cinnamon, allspice, and salt, and saute for another minute. Add the chicken back into the pan and pile the vegetables over the top of the chicken. Add the maple syrup, lemon juice, and chicken broth to the pan and bring to a boil. Cover with an oven-proof lid and finish cooking in the oven for 35-40 minutes, or until chicken is tender. Remove the lid from the pan and cook an additional 5 minutes in the oven. Remove and garnish with toasted almonds and dried cranberries. What is your favorite part about this Maple Roasted Chicken with Sweet Potatoes recipe? It might even be good for Thanksgiving dinner if you don’t want to make a turkey. The recipe alone is a 5 star. Cannot wait to fix this tomorrow. Love all the ingredients. Your recipes are amazing. I do not always take the time to comment, which is always helpful for others contemplating the outcome. p.s. Do you mind if I post this on facebook with your credits? You’re so sweet! Totally fine if you post on Facebook and credit me. Thanks for following my blog. I can’t wait to try this recipe!! It looks and sounds amazing…thanks for posting it 🙂 My only problem is that my oven is out of commission, so I’ll have to fix it on the stove-top…do you think that would work? Yes. It will totally work on a stove. It won’t get the roasted goodness like it would in the oven, but it will caramelize nicely and still taste really good. I have sensitivity/allergy to chicken thigh meat. I’m assuming that I can replace with chicken breast? And would you keep the skin on? PS. 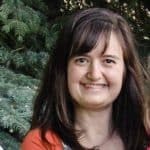 Just came across your blog, and look forward to learning more. Chicken breast would be a fine substitute. You can leave the skin on, if you like. Just make sure to keep the skin side up after browning so that it doesn’t get soggy in the braising liquid. I’m a terrible cook, plus with all my food sensitivities look for good basic recipes, with minimum ingredients, and leave out any sensitivities, ie garlic. Yesterday I made this sweet potato skillet, and it was delicious. The aroma in the kitchen while it was cooking is another nice benefit. I had enough for leftovers, which are as you know the best. I love this recipe. How would I be able to replace the chicken with beef, ie, steak, beef stew, etc. I’m assuming it would be the chicken broth, honey and lemon and the spices? If you want you could probably try adding sweet potato to it. Let us know how it works out if you do. The beef stew recipe was created to use beef and so it would work best with beef. You are welcome to try something else. Let us know what works well for you if you do. This is the most delicious chicken I have ever tasted. I had a hard time not eating it all! I made it with only 4 thighs and I would have been happy with double the amount of carrots and sweet potato. I did not have rosemary so that is the only flavor I was missing. I will definitely try it again with the rosemary. This was better than my favorite chicken dish at a Moroccan restaurant. Wow! That is fantastic! I am so glad you liked this recipe and you are making the adjustments that work best for you! Wonderful flavor combinations in this recipe. Looks amazing. This looks so good! I’m drooling right now. Pinned and tweeted. This looks absolutely amazing!! Yummy!! London Brazil @ Gluten Free with L.B. You’re welcome. Please let me know what you think if you try it.